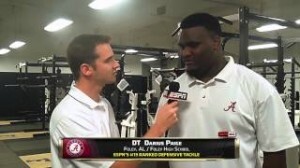 The Pensacola News Journal is reporting that Tide recruit Darius Paige's transfer is being investigated by the NCAA. Paige's transfer from his high school in Florida Washington High school to a high school in Daphne/Fairhope area, was controversial because some hinted that a Tide assistant Jeremy Pruitt who was recruiting Paige at the time, talked Paige into transfering to Foley High School to help him improve his grades. Sources say that the NCAA associate director of enforcement Renee Gomila will be in Pensacola this week to interview Washington High officials about Paige. This whole case is strange. There are allegations that school officials have discussed Paige's information on SEC school's websites and that Pruitt some how forced the resignation of the interim coach of his former high school. "This case is over and done with," he said. "The AHSAA and NCAA have both looked into his transfer and found nothing wrong." If you read the story, it sounds like it has less to do with Bama and more to do with his former high school. To read more about this breaking story, check out this link from the Pensacola News Journal.